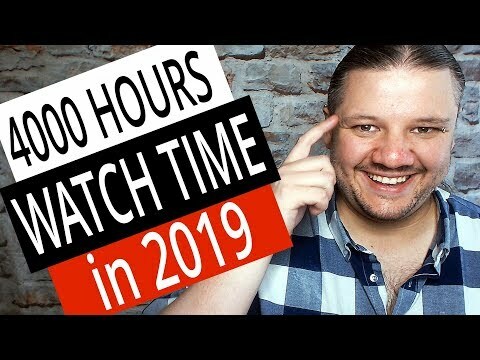 How To Get 4000 Hours of Watch Time on YouTube in 2019 // How to get more watch time in 2019. Watch time and audience retention helps YouTube to decide if a video is performing well or not. An engaged viewer that is entertained by the video they are watching with stay around for longer, interact with the content and subscribe. This is why YouTube made it one of the most important metrics for any small youtuber to focus on. In 2018 YouTube even added conditions to the YouTube Partnership Program that put watch time hours at the heart of monetization requirements. You now need 1000 subscribers and 4000 hours of watch time to apply for YouTube partnership. 1 – Make more videos to get more Watch Time in 2019 – The more videos you have on YouTube the more videos your audience can watch. It is much easier to stack 4000 hours of watch time if you have 100+ videos for a new subscriber to binge watch, rather than just 5-10 videos on the channel. 2 – Longer videos help you get more watch time on YouTube – You do not need to stretch a 2-3 video into a 30minute snore, but if you can extend a video, add more value within what you are offering, then your audience will watch for longer and help get you the watch time you need. 3 – Increase Watch Time on YouTube with Playlist Series – 4000 Hours of Watch Time can seem like a mountain to climb but if you make series content that links to each other and lends itself to binge watching, then you have set the trap you need to trigger this watch time hack in 2019. Series playlists auto suggest the next video in the playlists, can auto play the content and passively builds channel watch time. Pick a topic, break it down into 5-6 videos and really deep dive into the content. Why make a rushed video that is 20-30 mins long, when you can make 5-6 very detailed 10 min tutorials or documentary on a topic that explains it better and demands more engagement. 4 – Live Streams for fast Watch Time on YouTube – If you need watch time fast and your audience is engaged, why not live stream? Live-streaming is a great way to make quick less edited content that invites participation. Pop online with your favourite game or a live Q&A and watch your subscribers pop in for a chat. If you stream for an hours and have 30 people watch you, that’s 30+ hours toward your 4000 hours of watch time goal you need to apply for that YouTube Partnership Program in 2019.